US Markets were closed today for the Martin Luther King holiday, but poor data from China sent US futures down. DAX followed suit, although FTSE and NKY managed to remain flat. 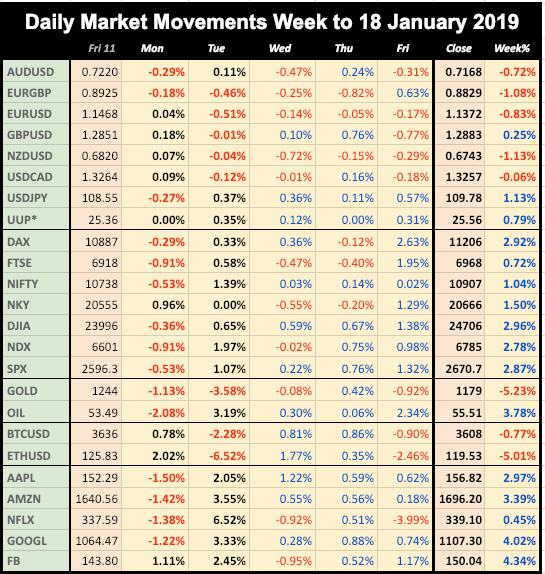 It was also a flat day for DXY, with small gains on the major currencies balancing a move down by commodity currencies AUD and CAD (and Oil), in line with the equity risk-off. Surprisingly Gold and JPY did not move up. Bond markets were closed. Markets continued downwards as the futures losses were translated into cash prices, not helped by mixed German sentiment reports at 1000, a miss on the US Home Sales print at 1500, and reports that the Trump administration had rejected an offer by the Chinese to travel to the US for preparatory trade talks. JNJ beat on EPS and revenue, but lowered guidance left the stock down on the day. IBM however, beat, and more importantly raised guidance. The stock soared after hours to open the next day 7.28% up. GBP ramped on hopes of a no-deal Brexit, and the AHE and Unemployment beats at 0930. Risk-off responses were as usual. JPY (and Gold) was also up, but AUD, CAD and Oil were down. A slight fade in EUR left DXY flat as a whole. Yields rose briefly but ended flat on the day. There was a late rally from NZD following the CPI beat at 2245. An earnings beat for PG, and the IBM result from the previous evening gave SPX an early ramp, but this quickly faded with the index giving up 2% in two-and-a-half hours, to recover later and close the day slightly down. Due to their timing NKY and DAX eked out a slight gain, but FTSE fell all day in response to the stronger currency, as GBP added nearly 1% on Brexit hopes, specifically the ruling out of ’no deal’. British lawmakers are seriously divided on what deal they want, but they all seem to agree that exiting without one would be disastrous. DXY was down 0.2% as EUR also advanced, as did AUD and NZD. However CAD fell after the Retail Sales miss at 1330, and following Oil down, which was not helped by the API stock miss at 2130 (a day late this week due to the Monday holiday), and JPY retreated after the BoJ statement where the Japanese inflation forecast was cut, a rare example of JPY responding to Japan issues rather than the wider world. Gold and bond yields were flat on the day. Oil was unusual, it fell sharply just as the EIA report (which was a big miss this week) would have been released, but of course it too was a day later this week. Equities were a bit directionless today, with further strong earnings sentiment being tempered by comments from TradeSec Ross that a deal with China was “miles away”. SPX and NKY were up slightly. DAX did better, benefiting from the fall in EUR, whereas for FTSE it was the reverse, as GBP appreciated. DXY was up 0.47% today, mainly due to a sharp decline in the single currency following gloomy European growth predictions from ECB President Draghi at 1330. AUD and NZD were also off despite the Australian jobs report beat at 0030. Only GBP bucked the trend, with EURGBP closing at a nine month low. Oil was up slightly despite the EIA miss (see Wednesday), and Gold was flat. Surprisingly yields were well down despite the stronger dollar. INTC reported after the bell, missing on EPS and revenue, and lowering guidance for 2019. Shares fell 7.2% after hours and in the Friday pre-market. The big story today was a report that the Fed is considering an early end to its balance sheet reduction program. After a quiet morning, markets all ramped on the news and the dollar crashed, with DXY down 0.78%. 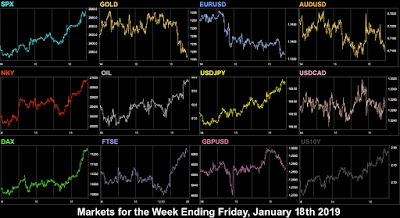 All currencies were well up, and Gold hit $1,300, a six-month high. Oil was up in line with equities. Yields were up as money rotated from stocks to bonds. Towards the end of the day, President Trump finally agreed to end the shutdown for three weeks, despite not getting his Mexican wall funding. If anything, the markets came slightly off on this. Please note all figures and percentages given for daily movement on indices are for the cash period. Currency moves are stated in relation to the US dollar. Dollar moves are referenced from the UUP ETF, which reflects DXY. 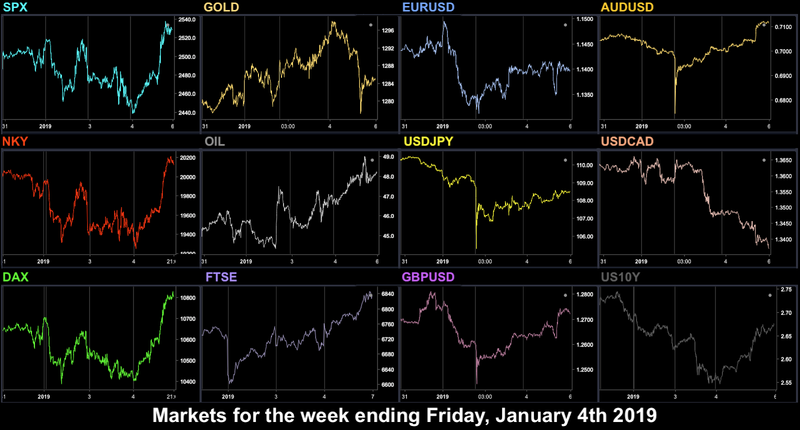 The ramp on Friday meant most markets ended more or less flat on the week, with only FTSE well down on a strong pound. The strongest currency by far was GBP, adding 2.48%, so buying GBPUSD was the best trade. Cryptos had a quiet week, as, in the end did the FAANG shares, in advance of AAPL and AMZN earnings. ECB President Draghi makes the introductory statement at the ECON hearing in the European Parliament today. Tariff-sensitive CAT reports before the bell, but the main focus of the day will probably further reaction to the Fed report from Friday. There is another Brexit parliamentary debate and vote today in the UK. The optimal outcome this time (short of accepting the deal voted down on Jan 15) is an extension to the Brexit date of Mar 29. The vote expected around 1900. Fourth largest DJIA stock MMM (5.32% weight) reports before the bell, but the big one is AAPL, who report around 2130, and have already pre-warned of reduced earnings. There is a rate decision on HUF. A big day today. Chinese Vice-President Liu leads a 30-strong delegation visiting the US for two days of trade talks. Expect some soundbites. The rate decision is at 1900, and a hold is expected by all (99.5% priced in on the CME Fedwatch tool). However, the content of the December meeting minutes will be scrutinised, although of course we have already had a lot of dovish signals since the last hike in December. Watch out for the ADP report, the estimate of 178k doesn’t make much allowance for the shutdown. It’s a big day on earnings, with DJIA heavyweights BA, V and MCD reporting before the bell, along with BABA which is not in any index. At 18.82% total weight, this is the largest single Dow grouping at one point, BA alone is 10% of DJIA. NDX during the day will of course have been influenced by the AAPL report, but after the bell we get NDX giants MSFT and FB (14.35% of the index) along with PYPL TSLA and QCOM (another 3%). Lots of European data today, with the first reading of European Q4 GDP. These preliminary GDP reports do not move the markets as much as the actual, which is several weeks away. After two rate decisions in minor European currencies, Black Sea neighbours UAH and BGN, and two central bank speeches, the main thrust is likely to earnings. The MSFT and FB results will be joined by troubled giant GE and V’s competitor MA before the bell, but the highlight will be AMZN, reporting after the close. It’s the last day of the month, so some rotation volatility may be expected from those asset managers that report monthly. The first day of the new month starts with close focus on the UK PMI (as GBP is so volatile these days), and oil giant XOM (2% of DJIA) reporting before the bell. However, it’s NFP day, with a reduced estimate from usual, probably due to the shutdown which has now (temporarily) ended. AHE and unemployment estimates are unchanged from last month. To finish the week, the important ISM PMI is at 1500, although it doesn’t have the same effect when coincidental with NFP. Note that Canada reports a week later this month, so our preferred USDCAD NFP trade cannot be done. Markets were down today after huge imports (-7.6% vs +5.0% est) and exports (-4.4% vs +3.0% est) figures from China. The trade balance beat, and hit a new high at $57.05B vs $51.53B estimate, but this just reflects the fact that imports fell a lot more than exports. Good, maybe, for China (Onshore CNY hit a six-month high), but not for the rest of the world that imports to them, and US and European indices duly fell. The dollar had a quiet day, with JPY and Gold advancing slightly on the risk-off mood, and Oil softening for the same reason. 10 year bond yields rose slightly. The first major earnings release C beat on EPS but missed on revenue, but nevertheless managed to end of 5% on an SPX down day. The big news of the day was the British Parliamentary Brexit vote, which was widely expected to fail. GBP had slid all day, and was down nearly 2% at the time of the vote. PM May lose by the worst margin of any British parliamentary vote in history, but traders hate uncertainly, and at least the vote is over (and some parliamentary manoeuvres make a no-deal less likely). Once the result was in, sterling then rallied 1.76% in an hour to close the day flat. US markets were rallied by strong results from JPM, and a set of Chinese stimulus measures (eg tax cuts), and after shaky start ended the day comfortably up, with NDX adding 2%. Strong earnings beats by BAC (up 8%) and GS (up 10%) continued the positive mood, and equity markets were up again although not as much as the day before. Oil was also up following the EIA beat at 1530. The GS result gave DJIA a boost over SPX. Only FTSE failed to post a green candle adjusting to the previous evening’s GBP rally. JPY (although not Gold today) predictably fell, although a flat GBP and EUR resulted in the dollar index only advancing slightly. Unusually for a positive day, commodity currencies AUD and CAD were not down. Yields were up 2bp in line with the stronger dollar. The US Retail Sales figure was not published due to the continuing government shutdown, the longest on record. An early US dip following the miss from MS (down 4.4%, after reporting EPS 80c vs 89c) quickly recovered on reports that US officials were looking at plans to scale down Chinese tariffs (even though these were later denied), and all markets ended up, except NKY which was flat due to the timing of markets. 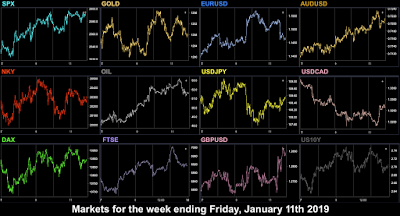 The dollar had another fairly flat day, advances against EUR and JPY (and Gold) being offset by another strong day on GBP which added 0.76% on hopes that no-deal Brexit can be avoided. AUD had an unusual sharp rally at 1800, which faded quite quickly. Oil had a flat day, as did yields. NFLX reported after the bell, beating on earnings but missing on revenue, and the stock slipped after hours. Stocks were sharply up on OpEx day, with all US indices adding around 1.3%. DAX did even better with its best day since the bottom reversal on Dec 27. Part of this was pushing through the SPX/DJIA 50% technical reverse (from the all-time high down to the Dec 24 low), but was also attributed to a Bloomberg report that China would ramp up US goods purchases to reduce the US-China trade deficit, and comments that the administration was sensitive to the Q4 market crash. Oil was also sharply up in line, as was USD which was up across the board, except for CAD, which was the sole outperformer after the strong CPI beat (2% vs 1.7%) at 1330. Yields rose in line with the dollar. The dollar was up 0.79% this week, but the picture was mixed, with GBP bucking the trend to add 0.25% as the uncertainty of the Brexit vote was resolved. 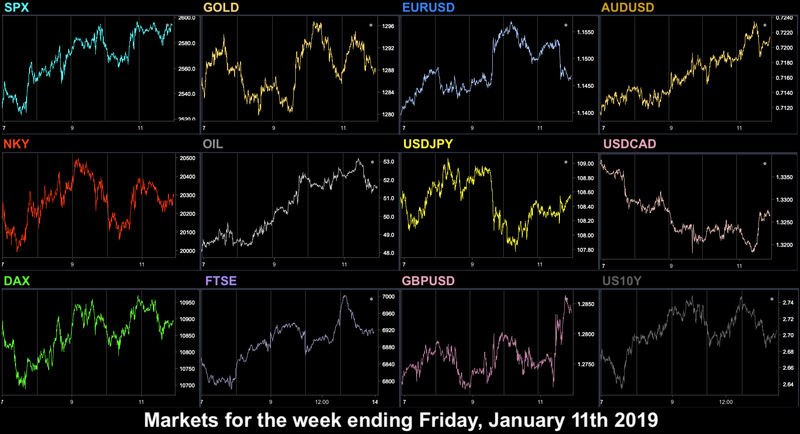 The weakest currencies were NZD and JPY, reflecting equity risk-on. Buying GBPJPY for 1.39% would have been the best forex trade. Indices were all well up, with DJIA (because of GS and JPM) just pipping weak-EUR assisted DAX. NFLX was static after its recent stellar run, but the other FAANGs outperformed NDX as a whole. Cryptos had a quite week by their standards, with ETHBTC fading for a second week. US Markets are closed for Martin Luther King's birthday. All other world markets are open, and US futures trade normally, but clearly volume will be muted. At some point today, UK PM May will present alternative proposals for Brexit. Commentators are now expecting an extension to the Mar 29 date. Chinese GDP will be watched closely given the recent downturn in imports/exports. Leaders arrive in Davos today for the World Economic Forum, although notably Presidents Trump, Xi, and Macron and UK Prime Minister May are all staying home to handle their various crises. UK average earnings are in focus, as GBP is so volatile at the moment. Earnings are due from Dow heavyweights JNJ and TRV before the bell, and IBM afterwards. These three companies make up 10.4% of DJIA. There is a rate decision (hold expected) on NGN. It’s ECB rate decision day again, but commentators are not expecting any surprises, other than maybe Pres Draghi to repeat his dovish remarks about growth from last week. Earnings are due from six NDX components INTC, ISRG, WDC, SBUX, AAL and CELG today, all after the bell except the last two. Together they make up 6.1% of NDX. It seems to be an unchanging convention that industrials report before the bell, and tech stocks afterwards. Romanian markets are closed for Unification Day. There is a rate decision (hold expected) on MYR. As is usual for Fridays in earnings season, no index majors report today. Next week is the big week of the season. There is also little news other than the three IFO indicators from Germany. After a dip before the open, the Friday rally continued after Fed Chair Powell’s dovish comments last week, and positive comments from TradeSec Ross on China, and despite the miss in ISM PMI at 1500. Once again, there was a timing issue. As DAX and FTSE closed at 1630 before the rally reached its top, they posted red days unlike SPX and NKY (futures). The dovish Fed remarks fed (if you’ll pardon the pun) through to the dollar. 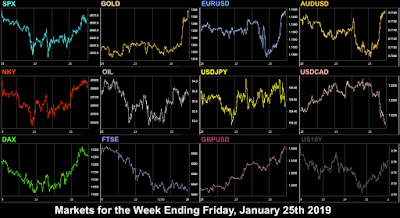 DXY was down 0.52% on the day, with all major currencies (and Gold) rising, except for JPY which posted a flat day. Yields also dipped but ended the day up in line with the risk-on mood. Oil was up in line with equities. The bullish mood continued on news that the China talks, currently in progress in Beijing would be extended to a third day. All indices were up, with the three US majors (SPX, DJIA and NDX) adding 1%. Non-US indices and Oil posted similar gains, and yields were up again in line with risk-on. USD had a Turnaround Tuesday, and DXY added 0.22%, with most currencies (and Gold) down. Once again we saw the continuing recovery of commodity currencies, with AUD remaining flat, and CAD adding 0.37%. FOMC members Bostic and Rosenberg continued the dovish theme today, with the former indicating only one rate hike in 2019. The published minutes confirmed the stance. The more specific information is, the stronger the effect on the market, and USD fell sharply, with DXY giving up 0.7% on the day, its worst day since Nov 1st. 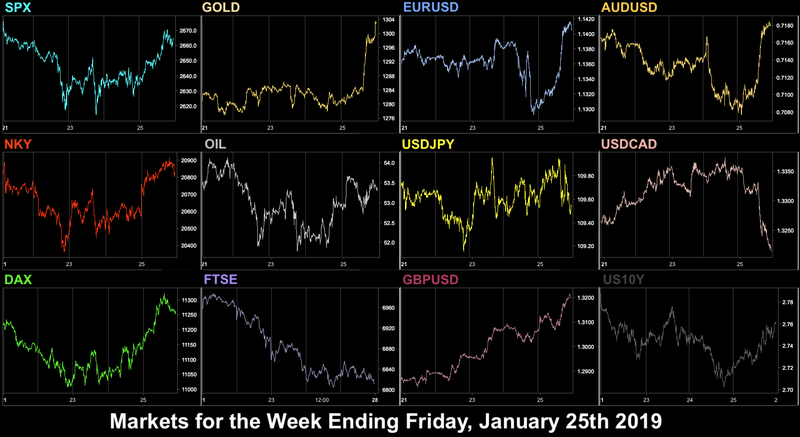 All currencies and Gold were up. US equities of course responded positively, however NKY and DAX were down, following the sharp spike up in JPY and EUR. FTSE managed a slight gain, as the GBP rally was less intense. Oil had another good day despite the EIA miss at 1530. Bond yields fell in line with the dollar, and after the auction of new 10-year paper at 1800 which yielded 2.728%. The BoC held rates as expected, and other than a brief (5 minute) 50 pip spike up, CAD ran in line with the other currencies. After coming off slightly in the Asian and European sessions, stocks continued their rally at the US Open, as the dovish Fed mood continued from Wednesday’s minutes. This was despite lack of detail in the China talks, and the continuing government shutdown. 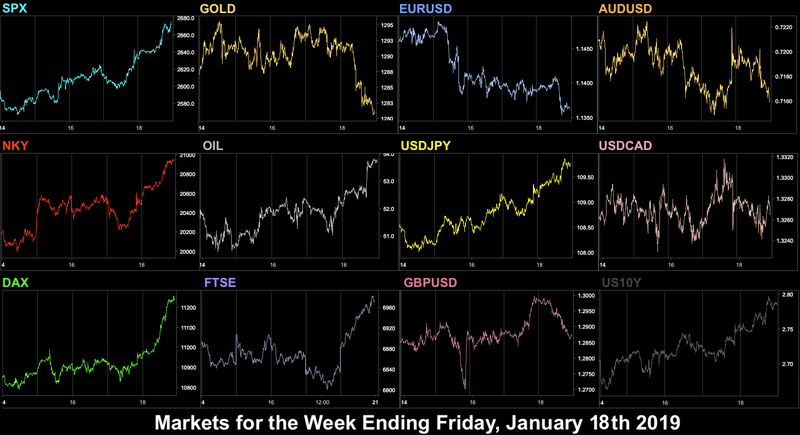 You normally see a fast fades in sentiment in stocks, and more slowly in currency, but today was the other way round. But remarks from Chair Powell that the Fed would continue to shrink its balance sheet to a more normal level saw a reversal in DXY, up 0.42% day, with Gold and the major currencies pulling back. Only AUD posted a modest gain. Oil posted its eight green candle in a row, although at 0.29% up, it was practically flat. Yields followed the dollar back up. 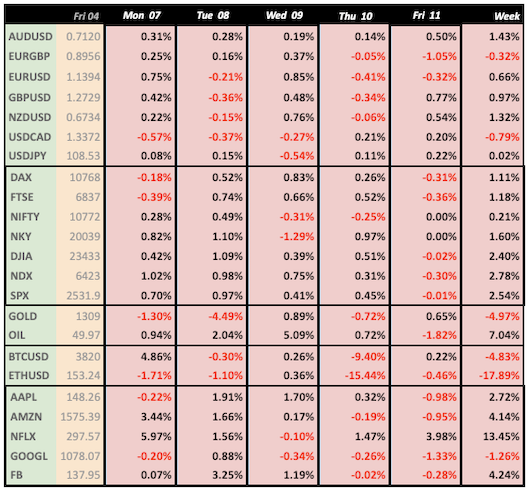 The end of the week saw a flat SPX, as the positives (slower tightening, China talks) and the negatives (shutdown, lack of China progress) balanced. 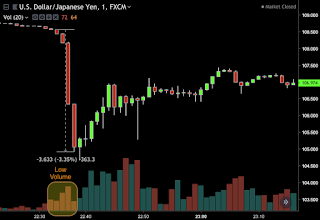 The indecision was clear with JPY slightly down but Gold slightly up. US Core CPI provided no assistance, as it printed at 1330 at 2.2% as expected. Elsewhere fared worse, with DAX, FTSE and NKY clearly down on the day, although retaining some of Thursday’s gains. The relatively small move in DXY, up 0.22% to follow through from Thursday masked a notable move in GBP, which was up sharply, adding 0.77%. The MoM GDP beat (0.2% vs 0.1%) at 0930 added 0.4%, and then a fast three minute spike from 1051 added 0.71%, as speculation mounted that the UK would seek to delay its withdrawal from the EU. There is more on this in the outlook for next Tuesday below. The GBP spike was accompanied bye a small tick up in EUR, although the single currency was sold off in the US session, giving EURGBP its first 1% down day since Nov 1st. Oil pulled back slightly, perhaps for profit taking. The CLG19 (Feb) contract expires on Jan 22nd. Please note all figures and percentages given for daily movement on indices cover the entire cash and futures period in that day. Currency moves are stated in relation to the US dollar. Dollar moves are referenced from the DXY basket. Like last week, USD was down half a percent , and AUD and CAD, joined this week by NZD, were strong, whereas JPY hardly moved. Risk barometer AUDJPY was the strong pair at 1.42%, although AUDUSD was similar. The best index was NDX, inline with risk, and the best stock in our group was NFLX which outperformed for the second week running. The movie giant is up an amazing 44.5% since Christmas. The ETHBTC rally collapsed again this week. We are seeing more and more divergence between the two leading cryptocurrencies. Today the earnings season kicks off, with the first mega cap, Citibank reporting before the bell. The market in Japan is closed for ‘Coming of Age’ Day. The most interest release of the day is the China Trade Balance. This rose continually throughout 2018, and consensus is a massive increase again. A miss could indicate tariffs are starting to bite, and halt the recent CNY rally. A big day today for the UK, with the rescheduled parliamentary vote on the ‘with deal’ ie ‘soft’ Brexit. As recent tactics by Europhiles have blocked the government from preparing for ‘no deal’, a failure for the Government motion to be carried is actually bullish for GBP, as it implies Mrs May and her cabinet would now either delay the exit date and/or run a second referendum. Although anything that suggested a general election would create uncertainty, and push the pound down. The earnings season continues with JPM, UNH and WFC reporting before the bell. The first two are 9.76% of DJIA so a Dow/SPX divergence is possible. Conversely, no divergence shows the sentiment of the results is carried into the market as a whole. Fed über-hawk Esther George speaks at 1800, it will be interesting to see if she contradicts the dovish statements from last week. George going dovish would be big news. Important inflation data from Germany and the UK starts the day, and may have an outsized effect on a volatile GBP from the day before. Today is the first day that the USTR can initiate new trade negotiations with Japan, so some statement may be forthcoming. After hawk George yesterday, we get the most dovish FOMC member Kashkari at 1630. He is no doubt with the ‘patient’ group, but is not a voter this year. The earnings season rolls on with two more banks BAC and GS reporting before the bell, and tariff-sensitive AA after the close. There is a rate decision on IDR. The first FANG reports today. NFLX earnings are out after the bell, and historically this has meant big moves in the stock, NDX and even SPX. Also two more banks report before the bell, DJIA component AXP and merchant bank MS. Fed Quarles (centrist, 2019/2020 voter) speaks on the anniversary of his appointment. There is a rate decision on ZAR. The main news today is Canadian inflation, although the day is generally expected to be quieter than the big days of Tuesday and Wednesday. No important stocks report today, although next week is packed, however today is Opex day for January. Fed Harker (dove, non-voter) will be speaking, as will Williams (hawkish, voter). On this final day of 2018, equity markets were a bi directionless as you would expect before a holiday. 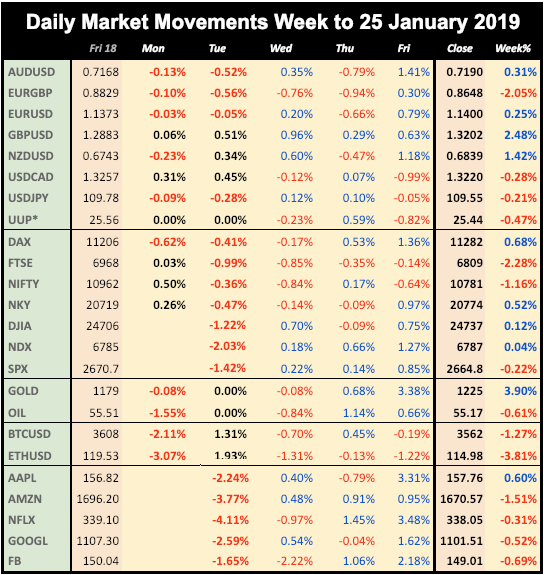 After a flat Asia and Europe, with FTSE closing completely flat at 1230, we saw a 1% dip at the SPX open which was quickly recovered, and the day ended a modest 0.32% up. DAX followed suit, although NKY was down after a strong (up 0.58%) performance from JPY. 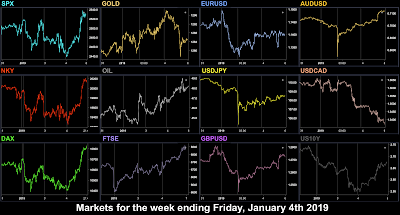 The dollar was down 0.38%, mainly due to the strong yen performance, although EUR and GBP also rallied. The JPY rally indicates negative sentiment, and commodity currencies AUD and CAD, and 10-year yields (rotation into bond) were down, and Gold was up, all in line with this. However, Oil posted a modest gain on the day. 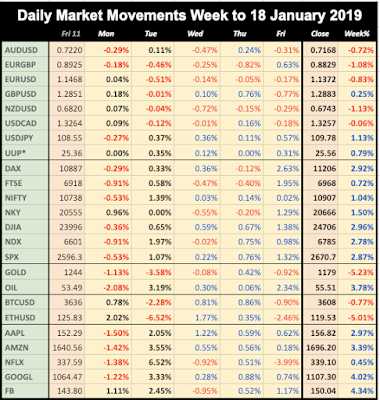 The first day of 2019 saw all markets closed, even forex and futures. Although forex trading opens at 2100 and equity futures at 2300, as they do on Sundays, we count that as being the following day’s session. The first significant data release of 2019 was the China Caixin Manufacturing PMI at 0145, which missed (49.7 vs 50.1), but more importantly crossed the line (50) from expansion to contraction. This spooked the thin Asian markets (Japan was still closed), and ES (SPX futures) which had opened well and was 0.46% up, promptly fell 2.69% in Asia, and it took all the European and US day to reduce that loss to 0.75%. As usual DAX, FTSE and NKY followed, the latter again hurt by further JPY appreciation. Only FTSE clawed back the losses by the end of the day, helped by a weaker GBP. There was a 0.6% recovery in USD today, although it was not uniform. EUR gave up 0.89%, and after the holidays produced no helpful Brexit news, GBP fell by 1.06%. Big moves on thin trading days. AUD was also down, but surprisingly, CAD bucked the trend and rose sharply in line with Oil, which briefly shot up 7% after tanker-tracking showed a big drop in Saudi exports in December. JPY, Gold and bond prices were up again, in line with the risk-off mood. The big news today was a cascade of events which happened after the close on Wednesday. It was started by the first-ever profit warning from AAPL, who reduced guidance based on poor China sales. The stock fell 7% after hours. Japan was closed for a third day, and it is thought that ‘Mrs Watanabe’ (the nickname for Japanese retail forex traders, the largest such group in the world) decided to go all out yen buying. This was in the ‘twilight zone’, the name given to the one hour (from 2200, 1700EDT) each day that futures markets close, the end of US activity, but before Asia opens, where volume is entirely from retail traders. 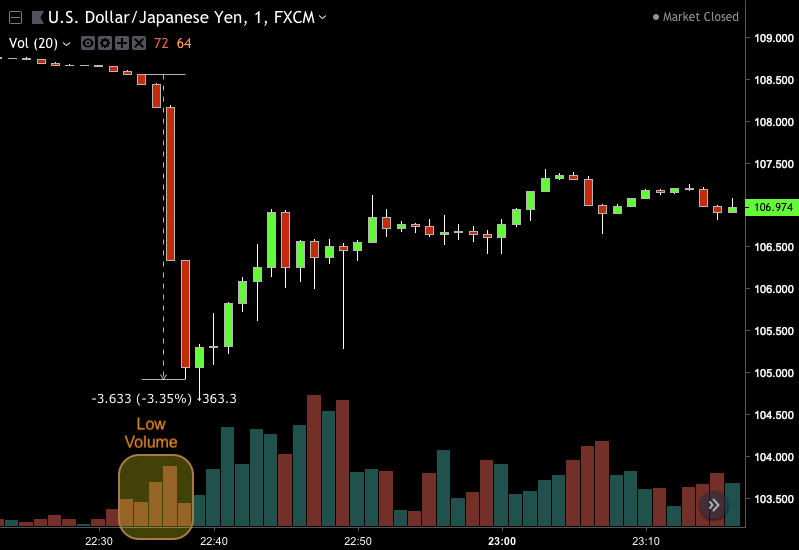 USDJPY fell 3.35% in four minutes, on tiny volume. AUDJPY fell 6.68%, and TRYJPY 10.98%. The additional move in AUD meant of course that AUDUSD also spiked down. USDJPY recovered over half the spike immediately but still ended up down 1.2% (ie JPY up) on the day, whereas the selloff appeared to be a turning point for AUD, (possibly triggering sell stops or even limit buys) which actually ended up on the day. GBP was also sold heavily so a spike down appeared there, but EUR, CAD and CHF suffered no more than USD, so the primary pairs were unaffected. After all this, the general result for the day was a 0.46% softening in DXY, with all currencies, Gold, and Oil up. The AAPL report weighed heavily on equities, and SPX finished 1.61% down, and NDX gave up 1.52%. AAPL was 9.96% down. This is interesting as AAPL is 9% of NDX but only 3.1% of SPX. This means that 0.9% (two thirds) of the NDX loss is directly attributable to AAPL, but only 0.05% (1/32) is. Such is sentiment. Non-US indices also fell (even though of course they don’t contain AAPL). And on a dime, it turned again, as we have seen so often in these volatile weeks. SPX had already started to turn up after the China Caixin Services PMI beat at 0145 (as contrasted to the manufacturing miss earlier in the week), but then the NFP figure came in at 1330 as a blowout 312k vs 178k estimate, it was reported that US-China trade talks would start next week, and to top it all Fed Chair Powell, speaking at 1515 said the Fed would be ‘patient’ with rate hikes. Markets soared, with SPX adding 3.2% on the day, its second best day since Feb 2016 (Dec 26 was better). All other indices were up, and Oil joined in the rally, despite the small EIA miss at 1530. Gold, JPY and bond prices fell sharply with the risk on mood. However a rally in GBP after its sharp fall, and a CAD advance after the Canadian NFP beat, plus a flat Euro (it briefly dipped at NFP but recovered) left the dollar basket flat overall. AUD also accelerated on the China hopes. A very strong week for yen, including the flash spike, and for commodity currencies AUD and CAD, whereas the others were virtually flat. Shorting EURCAD for 2.25% would have been the best trade. Indices swung wildly up and down, with all the gains on late Friday. DAX was the best performer. The outstanding FANG performer was NFLX, up 16.2% after a GS upgrade. ETH continued to outperform static bitcoin for a second week, up an amazing 90% in three weeks. Colombian and Russian stock markets are closed today, the latter observing Christmas Day in the Julian calendar. There is a rate decision on ILS. Fed Bostic (hawk, now non-voter) speaks in Atlanta. At some point this week, the first round of fresh US-China trade talks starts. The JOLTS jobs openings figure is published at 1500, and the trade balances of both the US and Canada are published simultaneously, another USDCAD volatility opportunity. Potentially, the most volatile day of the week for CAD and GBP. Around 1230 today, the UK parliament begins debating the Brexit withdrawal bill, which will continue until the crucial vote scheduled for next week. We stay with the UK for BoE Governor Carney’s speech, but before that, there is the Canadian rate decision. A hold is expected, so the commentary will be the key thing. It is of course FOMC minutes day as well. We have heard a lot from Chair Powell recently, so don’t expect any surprises. These are of course the minutes for December which resulted in the infamous rate hike. Normally the ECB minutes would be the main event today, but a speech by Chair Powell, and one from Vice Chair Clarida (a bit more hawkish than Powell, voter 2019 and 2020) will probably steal the show. There is a rate decision on PEN. US inflation is the important print today, with an expected tick down in the core (ex food and energy) figure from last month to 2.1%. The GBP data may be interesting depending on how the Brexit debate has been going on. This is the last day before earnings season starts properly with Citibank reporting on Monday before the bell.